One thing that I learned in 2017 is that a fresh start can happen at any time. And sometimes things that happen on our life require fresh starts. DON’T just say, “let’s see what happens this month.” Be intentional by creating a list of things that you do at the beginning of the month (a great place to create this checklist is in Evernote). Think of it as a monthly detox or cleansing of the old and ushering in of the new. 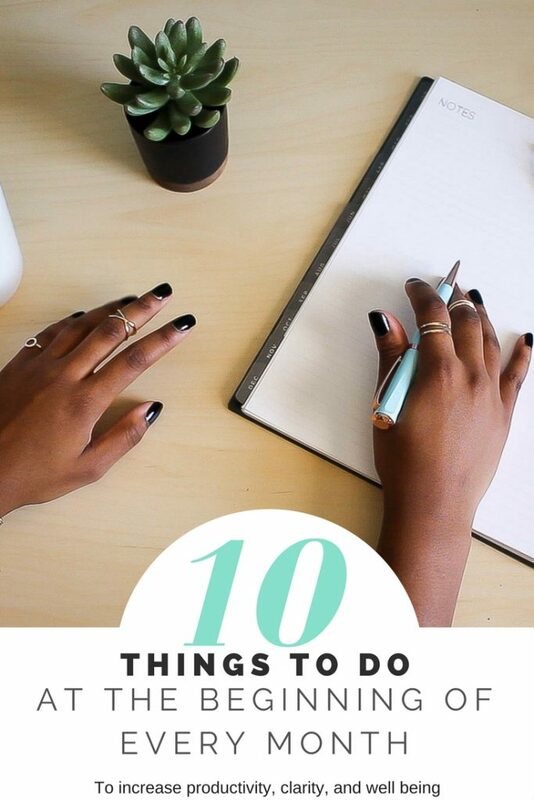 This list of 10 items are a good place to start. 1. Reflect on the previous month and make adjustments. Hall and Simeral says, “the more reflective you are, the more effective you are.” Spend some time reflecting on the past month in your life, brand, business, and blog. Sometimes so much happens, that sometimes we miss milestones. Reflection is not just on the bad, but on the good. Celebrate every milestone, but of growth, and achievement. I have a brand monthly report, where there is space to reflect on how things went in your business the previous month. This is a most important step. After you’ve spent some time reflecting, it’s time to make adjustments and move forward. You can set the intentions for how your month goes. Check your goals and vision board. Add items to your to do lists based on your goals and vision board. Find affirmations that align with your attentions for the month and add them to your morning routine. Your intentions are important and should be frequently aligned. Proverbs 23:7 says, “for as he thinks in his heart, so is he.” What we think, we are. Make sure your intentions align with the vision for your life. 3. Clean purse and totes. I collect a whole bunch of stuff throughout the month. I sometimes wonder why my purse weighs as much as a gold brick (but not quite as valuable). I probably could have knitted some sweaters or recorded a podcast in the amount of time I’ve spent looking for stuff in my purse and totes. Don’t be like me (smile). 4. Plan self care and time with loved ones. Look at your calendar and find a day/weekend that you can block out as your time. These are the weekends we’re PJs are considered dressed, makeup is not required, and bingeing is not frowned upon. Also, it’s important to be intentional about scheduling time with family and friends. Schedule calls with friends that live out of town. Keep that time as sacred as you do business appointments. Schedule coffee or lunch dates to catch up with other friends who are more local. If you’re traveling, try to schedule time with friends in the locale you’re visiting. As an entrepreneur and side hustler, our time may feel limited. But friendships multiply and amplify the good in life. 5. Record social media stats. With changes in algorithms and how we post content, sometimes our social media growth seems slow. While I don’t want you to always count numbers, I think it helps to at least chart your progression monthly. In my brand monthly report, you can quickly jot down these numbers and see where you are. My girl Jonna of Naturally Glam gave me this tip last year and it has been a game changer. Rather than doing that frantic scroll through my over 11,000 photos, photos I use regularly or are part of a particular part of my brand are saved in albums on my phone. While I try to manage it as I go, it doesn’t always happen. So once a month, I go through photos. I delete ones that are no longer relevant. My photos back up to DropBox, so if I absolutely need them, they are usually there. I add photos to existing albums or create new ones. I delete photos that are no longer useful from your albums. Take an hour (or less) and go through your calendar and schedule appointments for the month. Doctor. Hair stylist. Make up artist. Nail tech. It avoids the frantic “Can you fit me in? Please, baby please” calls when your brows look like caterpillars. 8. Check and set budget. These may not be the “funnest” activity, but it is a necessary one. I have some serious financial and personal goals this year, and maintaining my budget is the key. 9. Deep clean your home. Nothing says fresh start like a freshly cleaned space. Take the first week of the month and “bless your home.” I have an Evernote-based set of templates that will prove invaluable in managing your cleaning schedule without feeling like you’re tethered to your home on Saturdays. 10. Choose a book and other content you want to consume. Being a lifelong learner is important. Feeding your mind not only helps you in your brand or business, it helps you mentally and physically. With so many studies being done about brain health, we have to be intentional about keeping our brain stimulated and activated. So in addition to books that help grow your business, listen to audio books. Watch documentaries. Expand your music library. Entertain yourself by binge watching shows. Incorporate it into your daily activities or make an event out of it. It will be worth it! The greatest power we possess is our understanding that life gives us a fresh start at any moment we choose to start over. I hope these tips helped. Leave a comment below with your “fresh start” activities for the month.